At some point, every homeschool mother experiences homeschool burnout. Parenting and homeschooling are demanding, even for the most devoted mom, so it is not surprising we eventually reach the point where we can feel that burned out feeling creeping in. So what do we do? You can’t solve a problem unless you clearly identify the source so the first thing to do is determine what has driven you to this point. This can vary from mom to mom, but will generally fall into one of these areas. Unrealistic expectations of your children – Do you expect too much of your kids? Are you planning too much? Taking on too many subjects? Are personalities clashing and causing stress? Running around too much and trying to involve your family in too many activities? Expecting things that aren’t developmentally appropriate? If your expectations are out of line, you’ll be in for some significant stress. Listening to the wrong people – Who is impacting your homeschooling outside of your home? If people are sending you negative messages about what you’re doing, it can contribute to burnout. Are you listening to your instincts about your children or being swayed by others who don’t know your children the way you do? Are you careful who you spend the most time with so they influence you in the best way possible? Life challenges – Life doesn’t stop just because we homeschool. People become ill. Extended family problems develop. Job stress begins. 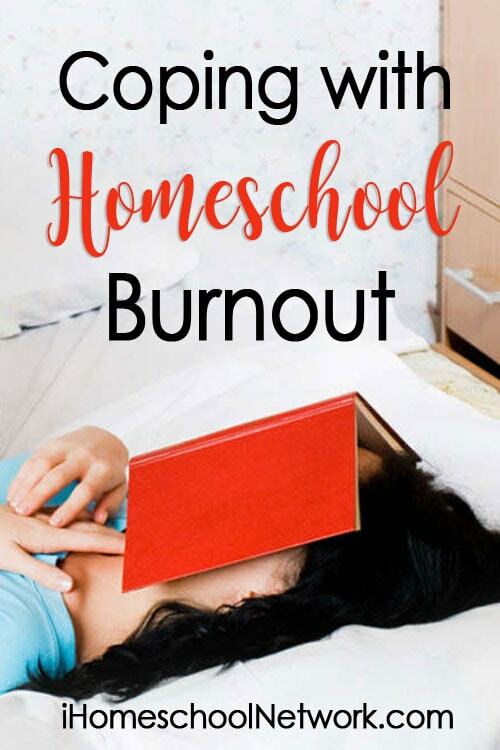 There are so many outside factors that can lead to homeschool burnout that have little to nothing to do with homeschooling. The emotional wear and tear of life challenges can spill over in the homeschooling arena and make us think that homeschooling is the “problem” when it is really the residual impact of other factors. Unrealistic expectations of yourself as a mom, wife, and homemaker – No homeschool mom can do all she desires to do. There are too many great ideas, great books, great websites, great curriculum options, etc. to do it all. The same goes for being a wife and taking care of your home. You can’t do it all. Taking on your child’s education is a big commitment. It will necessitate that you relax your expectations in some other areas or you will push yourself directly into burnout not only in homeschooling but other areas as well. So how do we deal with homeschool burnout? The solution will also be dependent on the source of the problem, but here are a few suggestions. Scale back – If you have been expecting too much of your children, you need to scale it back. You can do this by slowing down, eliminating some things, or making what you expect from your children more in line with where they are developmentally. Ditch the negative people – If there are people in your life who are truly making your homeschooling experience more difficult, you need to ditch them as much as possible. If it’s family, it can be more challenging to do. But at the very least attempt to set up some healthy boundaries so you are interacting with friends and family who support what you are doing. Minimize your interaction with the negative people who don’t have your best interest in mind. Take a break – Sometimes the best thing you can do is simply take a break, especially if outside pressures are impacting your homeschool. Some families homeschool for six weeks and then take a week off. Whether you take a break on a regular schedule or simply do it once to allow everyone to catch their breath, this can be a valuable strategy. Change things up – Sometimes you really do need to completely change things. Trying a different homeschooling approach or a different schedule can make a tremendous difference. Don’t be afraid to make your homeschooling mom-friendly. The most effective homeschooling experience has to be what works for everyone, not just what is best for the kids. If homeschooling your children is burning you out, you need to make some changes. Traditional education has often been described as an assembly line. Children are put through the process at the same time according to their age and the requirements of the state. Homeschooling is a completely different educational model (or should be!). Teachers don’t have the freedom to tweak things according to the needs of individual students. You do! You also have the freedom to adjust things according to your needs. Remembering that homeschooling is a dynamic, ever-changing experience can help you eliminate many sources of homeschool burnout. It’s a journey and the more you can relax and enjoy the process, the less prone to burnout you will be. Love this advice, Sallie. We homeschool moms need to hear these words every now and again, to keep burnout at bay. Thank you, apronstrings! I’m glad you found it encouraging!